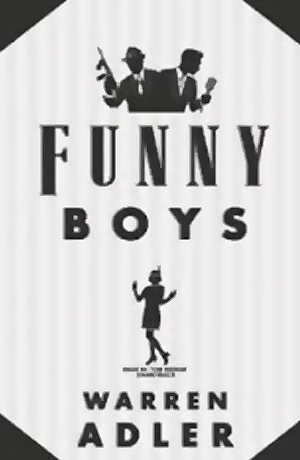 McMahoniacs - Julian to produce and develop new movie "Funny Boys"
How many of you know about the bestselling author Warren Adler? I have to confess I didn't, but when I read that he was the author to the novel that was turned into the movie "War of the Roses" (Kathleen Turner, Michael Douglas & Danny DeVito) it sure rang a bell. As it turns out, Julian is apparently about to produce and develop a new movie from one of this author's novels; "Funny Boys" - along with Gray Eagle films and Charlie Loventhal, whom I guess he met while doing "Meet Market". How do we know all this? Well, we were contacted the other day (by e-mail) by the Communications Director for Warren Adler's company Stonehouse Productions, and he offered to send us the official press-release. Thank you so much to Mr. Steven Ramotar. Nedless to say, we are thrilled to post it here on our board. Julian McMahon (Nip/Tuck and Fantastic Four) and Charlie Loventhal (Mr Write and Meet Market), in partnership with Grey Eagle Films/Grey Eagle Development, will be developing and producing FUNNY BOYS, based on the novel by Warren Adler. Paradigm will package the project. Adler is best known for the blockbuster novel “The War of the Roses“ which spawned an iconic film and international play. Set in the 1930s in Brownsville Brooklyn and the famed New York State, Catskills, FUNNY BOYS, follows the story of Mickey Fine whose ambition is to be a comedian and follow in the footsteps of the great names of the era; Milton Berle, Henny Youngman, Sid Caesar, Jackie Mason, Joan Rivers, and scores of others who got their start in the many Borscht Belt hotels. Jonathan Robert Adler, CEO, along with Grey Eagle COO, Stephen Greenwald, former President of DeLaurentis Entertainment Group and Embassy Pictures, have already launched a number of development/producing deals.